Sometimes shattered, never open. Nothing matters when you're broken. That was me whenever I was with you. Always ending. Always over. Back and forth, up and down like a rollercoaster. I am breaking that habit today! It actually turned out very different from the first time I planned it since along the way, I got inspired to do new things and let this wallpaper be a freeverse on its own. And I came up with an ethereal wall, scenic but not quite, textured but not entirely, and both induced with passion and melancholy. the main theme of this wallpaper is how I have dealt with pains and sufferings that practically every person has dealt with or is dealing with today. And just as I've said earlier, the best way to deal with pain is to let go of that baggage. Forgiving those who has hurt you deeply and at the same time, becoming a stronger person. My pastor once said that sometimes, because of these sadness, this pains in life, we simply tend to give up, not knowing the wonderful rewards lying ahead if we press through and continue the adventure. It's just a matter of time and effort before we get there. Afterall, obstacles are nothing but things to step on towards victory. Angels is all about love. that despite every other bickering, confrontations and disappointments you've had with yourself, with other people, there is always hope ahead. Keep the faith. It will bring you somewhere. Angels is actually a poem I wrote months back wherein during those times, I was experiencing several difficulties of being a Christian, because living up ones faith is a test of endurance. And in a certain way, I was able to make art out of the many experiences I had in my life. Afterall, I'm simply talking about experiences. it's wonderful how you experimented with different styles, and i think you successfully conveyed a feeling of hope here. 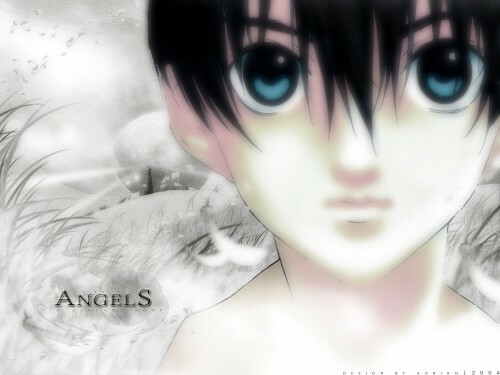 i also luv the grayish look of your background because it emphasizes the angel more and focuses our attention on him. the scenic background has very nice details, and i luv how it looks drawn. i also get a sense of innocence from looking at your wallie. woaaah this so fantastic! i luv the color! It's very very very nice, and beautiful, but who is it?! ?